On Tuesday, Maria Gurrolla of Nashville Tennessee went through every mother’s worst nightmare. Not only was she brutally attacked and stabbed multiple times, but her attacker kidnapped Gurrolla’s four day old baby, Yair Anthony Carrillo. Before I jump into the details of why this story is showing up on an immigration blog, just take a moment to think about this. A four day old child has been taken away from his mother. How many of you have seen a newborn when they are only hours old? Terrifying that this child has been torn away from his only lifeline (and chance for survival) only days into his life. Can you imagine? THE PROBLEM with instituting a terror program such as the Department of Homeland Security’s ICE has done—wherein violence, raids, SWAT team-like tactics or routine demands for “Your Papers” are normalized—is that it not only models gross behavior as a moral compass for the rest of the nation, but it also sends a message to Latinos and immigrants that they should expect and submit to this type of behavior whenever it comes their way. I think that this connection must be made. Immigrants must be taught to trust U.S. law enforcement and criminals can take advantage of their fears of deportation or police, said Yuri Cunza, president of Nashville Area Hispanic Chamber of Commerce and publisher of La Noticia, a Spanish language newspaper in Nashville. Why, exactly, would immigrants “learn” to trust law enforcement after they’ve seen stories like the one from last summer, where a woman in Nashville named Juana Villegas de la Paz was shackled to her hospital bed while giving birth due to suspicions about her immigration status. The continued dehumanization of immigrants and the continued conflation of [Latino = immigrant] in the minds of Americans will foster more and more incidents like this. A precedent has been set and it is up to us and the current administration to break that precedent. It is not up to immigrants to “learn” to trust law enforcement as Mr. Cunza has stated above. It is up to law enforcement to gain that trust. In the mean time, I’ll be praying for baby Yair’s safe return. In an effort to truly represent the country’s concerns at today’s meeting with DHS Secretary Janet Napolitano, the Reform Immigratin FOR America Campaign asked YOU to submit questions you wanted Napolitano to address. The response: you sent in more than 4,000 questions in less than 24 hours. Ali Noorani, executive director of the National Immigration Forum, and a partner of the Campaign to Reform Immigration FOR America, was able to ask Napolitano two representative questions selected from the 4,000-plus entries. The first was submitted by a person in Pickerington, Ohio who wanted to know why Napolitano has focused too intently on border security and stopped advocating for comprehensive reform. Napolitano said she has been working on immigration reform, and would do more to communicate with people on her efforts on both fronts. It’s amazing to see the voices of the grassroots communities speaking directly to lawmakers and the White House. FIRM has always tried to amplify the voices of communities who don’t always have a space at the table. In 2006 and 2007, millions marched in the streets for immigrants’ rights and reform. Now, those millions are moving beyond the streets to swamp switchboards, email accounts, fax machines and the halls of Congress. FIRM and RI4A was there to tell Secretary Napolitano that she must to take a leadership role in building support for comprehensive immigration reform on Capitol Hill and with the American public. She told said that she understands that she has do a better job communicating and a more consistent job of leading, but we need to see action to be sure she got the message. The President is clear that he wants immigration reform to move forward this year so that we can pass a bill early next year. To do that, we need to see more motion from Congress and more push from Secretary Napolitano. We hope to see detailed congressional proposals shortly after recess. 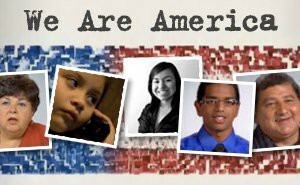 Tomorrow, the FOR America campaign will deliver the more than 4,000 questions that you asked to the Department of Homeland Security and Secretary Janet Napolitano. The administration is hearing your voices and they know they must respond. We continue to build momentum and we will work with you to keep pressure on the administration. Last week, amidst growing frustration from immigrant rights groups and advocates, folks from FIRM groups in New York (NYIC) and Los Angeles (CHIRLA) took to the streets to protest the expansion of Bush-style immigration policies and legislation. While many of our groups (FIRM included) looked to the Obama presidency as a “New Day” for immigration, the reality of recent weeks has worn patience thin. The New York Times ran a story this week, highlighting the growing discontent and impatience. First, there was the expansion of E-verify – a fatally flawed electronic verification system that threatens not only American workers but immigrants caught up in the endlessly bureaucratic immigration system. Then, there was the expansion of the 287g program – which gives local law enforcement the ability to enforce federal immigration law and is rife with racial profiling and abuse of power. To be frank, we were promised a “new day” and we feel like we are seeing more of the same. “We are expanding enforcement, but I think in the right way,” Janet Napolitano, the homeland security secretary, said in an interview. There is a desperate need for broader oversight of our immigration policies. Escalating enforcement without reforming our immigration system comprehensively only exacerbates the problem and it will not render long-lasting solutions to our immigration chaos. President Obama promised a new day for immigration policy in America, but we have yet to see sufficient change coming from DHS. Rather than overhaul misguided Bush-era immigration enforcement strategies, DHS continues to pursue policies that have done little, if anything, to solve the crisis of illegal immigration. These policies continue to increase fear in our communities and undermine public safety at a time when the nation is waiting to hear your plans for advancing real, comprehensive immigration reform. While, on a personal level, I have been very disappointed with the recent moves from the administration (especially the expansion of 287g), I still have faith that the President is ready and willing to bring sensible solutions to the table to help fix our broken immigration system. I firmly believe that we need to keep up the pressure and make our voices heard in order to push for this. Obama (and the United States for that matter) can’t afford to not succeed on this issue. Last week, it was announced that the Department of Homeland Security was signing 11 new local law enforcement agencies onto the program known as 287(g). The program grants local law enforcement agents the authority to enforce federal immigration laws. The destructive program cultivates a culture of fear among immigrants and communities of color, pours resources into the rounding up of immigrants instead of the protection of public safety and has been condemned by everyone from independent think-thanks to the Police Foundation. So why is DHS continuing this failed program? While the announcement was made alongside the pledge of a long overdue “review” of the program, it is a mistake to expand any failed enforcement program in the absence of satisfactory comprehensive immigration legislation. Let me be clear, this is the program that gives Sheriff Joe “I don’t have to answer to the DOJ” Arpaio the authority to round up Latinos like cattle and ignore his commitment to the actual protection of the public. This is the program under which Juana Villegas de la Paz was shackled to her hospital bed while giving birth to her child. This is the program that was found to “create a climate of racial profiling and insecurity” by a leading national university. I am disappointed that the announcement of a review of this program was accompanied by an ill-advised expansion. This, more than anything, points to the need for a FULL OVERHAUL of immigration policy. We cannot continue failed programs in the absence of comprehensive reform. Enforcement-only schemes were the rage back when anti-immigrant demagogues were in full roar and Bush officials wanted to show how tough they were. They bring us no closer to an immigration system that works. 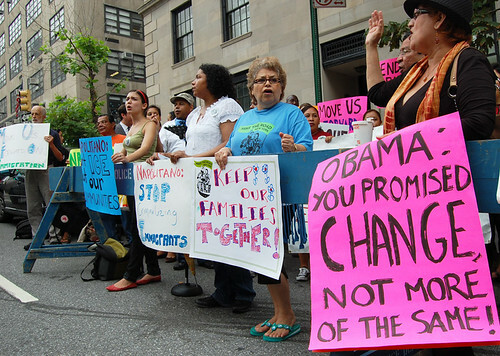 Mr. Obama promised fresh ideas on immigration reform. So far we don’t see them.